I’m sorry to return to this topic but it appears to need some more discussion. Fair enough. But it does not contradict my comment which was partly to defend Popper and partly to point out that it is wrong to conclude that Popper would classify global warming as non-scientific. Unlike some other skeptics (anti Popper skeptics not anti-global warming skeptics!) I don’t think that we need throw away the falsification principle altogether. It is just that applied physics needs to be treated rather differently. Ray Ladbury made the same point in #25; I also agree with him that the overall decision about climate has to be a choice between the consensus and any alternatives that might come up. As for relative humidity, I should have omitted the word “average”. The corrected version (without reference to averaging) is a much stronger law and thus easier to falsify. From what I have read in RC, relative humidity is an approximate output from the models, not an input as your comment suggests to me. Its approximate constancy is part of the understanding of global warming theory which is an important part of the subject. But is it necessary that it be universally true as required by Popper? If it turns out that this work is corroborated, i.e. that the humidity law breaks down over the Antarctic, that would be an excellent example confirming falsification in action. In a non scientific subject this kind of falsification would be logically impossible. Suppose that existing climate models can be shown to be inconsistent with Monaghan et al’s paper. That would be a further example of falsifiability now applied to the models. But Gavin might well conclude that this modification has little effect on the estimate of the warming of 3 degs. C produced by doubling the CO2. It could get worse, perhaps revised models would come out which would be consistent with dry air over the Antarctic but also have no significant impact on the 3 degs.C estimate. Would that indicate that the forecast was non falsifiable? No, because it can be tested directly by waiting. It would indicate, something else, that the forecast does not depend on the universal and exact nature of the humidity law. There are different degrees of falsifiability and Popper’s ideal is mainly intended to apply to universal laws (that partly depends on which book by Popper you choose to read). A big issue with his passive model is that it seems to model an Earth that has no thermal mass. In particular no oceans. His temperature projection is a simple function of the GHG concentrations. If the requirement was to model the effects of 1% per six month rise his passive model would simply arrive at his 80 year figure after 40 years. The GCMs and better simple models should do something quite different, they should then project a temperature rise that lags well behind his passive model. This is the effect trying to heat up an Earth that has thermal mass. Also his suggestion that the GCMs all predict little more than passive global warming is a bit of nonsense as they project not just the headline temperature but also its zonal distribution not to mention rainfall and cloud cover (which he later notes). Simple models can (and should) be in agreement with the headline temperature projections not just for one scenario but for many different scenarios. Somehow I doubt his simple equation would pass such a test. Gavin: Thank you for responding so fully to my questions. Honest? Credible? Both are admirable. I guess you mean to imply that even an honest man could be deluded, so I ought to judge what is said and not just who says it. Your advice is good. Judging credibility is not easy, so I will keep a weather eye out for honesty, just in case. I cannot judge the honesty or the credibility of this, though the obscure affront sounds a discordant note. Forgive me, as I’m no modeller, but is not uncertainty just a feature of a measurement, so whatever provides a measure, whether it’s a ruler, a gauge, microwave detector, photographic film, etc., has an uncertainty associated with it? If a model (or any calculation) outputs a temperature, then uses that very measurement to output another temperature with another uncertainty, and then again, and again, then those uncertainties compound, don’t they? I said: What are the ramifications for the AGW hypothesis of the lack of atmospheric warming over the ten years since 1998? Arguably, since 1998 was driven by an exceptional El Nino, there’s been no real warming since about 1979, just going by eyeball. It’s up and down, but no trend you could hang your hat on. Temperature today is the same as 1979. See Junk Science. I hope you understand why I’m pressing the point. Being an argument about warming, the temperature is central for everyone. My role with the Climate Conversation Group is to speak to public meetings about global warming, and I’m trying to gain a good understanding of the science, or at least where to locate vital bits of it. The actual temperature is fundamental. We can scarcely argue over the cause of the temperature if we don’t know or disagree on what the temperature is! So if you can refute the non-warming then I need to know—rather, I’d very much like to know—what your reasons are. So I can pass them on. I understand that it’s impossible to ‘know’ the average temperature of the earth, whose surface varies so wondrously, but even so, we try. I seem to recall it was James Hansen who figured out a method that gives an answer we can work with. I said: If CO2 is to warm the atmosphere, and warmer still with more CO2, then if CO2 rises but temperature is constant or falls, the theory is disproved. Done. Where is the faulty reasoning? Or what is the change to the theory? You quite properly advise me to get more understanding! That’s why I’m enquiring—I acknowledge my ignorance. But people are asking questions of me, and I would like to respond to them, so I would gently ask you to state the reasons for your comments. Since I imagine the IPCC report is a poor textbook, I wonder, could I ask you to address yourself to the reasoning in my question, rather than ask me to find some publication (that you know does not exist) that reflects it? I suspect that imposes on you a kind of burden of having to go back almost to first principles, perhaps, to answer my naive inquiries, but is it not the duty of the learned to spread knowledge? It might sound as though I’m flattering you to get my own way, but I’m not. I’m pressing on you the most rigorous logic to force you to answer me with science, not your personal preferences. Are you up to that, Gavin? You see, I cannot accept your first response. You were surely being less scientific than sarcastic, if I were honest (even if not credible). For I did not mention weather, or variation. I simply observed that the temperature had not increased, or had not trended upwards, and asked you what that meant for the AGW theory. If the temperature record is accepted, then for 20 years warming has been obscured by natural variation. If that was true, then how do we know that warming was present? And if warming was below the natural noise, how on earth can anyone detect the size of the human signal in the warming? If that is so then AGW need not fill us all with this dreadful twin sense of guilt and approaching fear. So these, sir, are valid questions even from the mouths of idiots. I am faced with having, perforce, to answer such questions, and I would be grateful for all the help I can get. I’m asking others the same questions, since not only do I not know the truth, I don’t even know who’s got the truth—that’s how little I know! Given the disingenuous tone of your post, I rather doubt that you are serious about wanting to learn more. However, on the off chance that you ever do become genuinely curious, here is a course of study. If after looking these things over you still don’t feel you have enough ammo to blow the denialists out of the water, come back. It is not clear if that is/was your opinion, or repetition of comments that you have heard. Whatever, it is a ridiculous statement. Any large and complex system with a relatively large response time, that response will be “noisy”. Another climate analogy that shows how far off the mark the comment is, is the familiar seasonal change behaviour. The fundamental seasonal forcing is the change in the fraction of the given hemisphere, that is in sunlight. In spite of the smooth change of that fraction (the forcing), the response of average temperatures (daily, weekly and even monthly) is far from smooth. Sometimes even a monthly average is out of sequence from what would be expected from the forcing. To put it bluntly, it is a stupid and ignorant statement. Thinking about this comment reminded me of a post that reflected that there seemed to be a lot of Electrical Engineers that are climate change denialists. Maybe it is because some electrical engineers cannot get their heads around dynamic systems that have very slow response times (compared to electrical response times). Just a thought! Re : answer to #101. Thanks for your interesting reply Gavin. “Popper doesn’t really come into it” (out of context). In view of your comment, I conclude that it was a very bad example and shall therefore withdraw it. But I am not sure about the undercutting bit. It reminds me of a discussion I read about ambiguity. This is often caused by a confusion between the main point, the sub-point and the exemplifications of the points. I’m sorry if I was ambiguous. It is not hard to choose another example or the same example with a different observational method. 1. Popper need not come into it, he may have been overated, but since others have brought it up, falsifiability deserves a brief exploration. 2. Your subject is far more falsifiable than e.g. economic modelling because unlike the latter, it is pinned down by highly exact and therefore highly falsifiable laws of universal validity. 3. There are some new universal laws which come into the explanations like the log law and the humidity law which can be used as an aid to understanding. These are also falsifiable in principle. “In principle” is good enough. This discussion is about logic. 4. That the models are in a different category from the foundation laws because they involve initial conditions additional hypotheses, approximations etc. You get the same thing all over science. It is frustrating from a practical standpoint, if they have loose joints, but climate models don’t seem special to me. They can be tested. They improve. Models of string theory, on the other hand, might have been criticised by Popper if he had been alive, because, as far as I know, they don’t yet come with a method for testing. 1. PDO/largescale ENSO trends can last between 20-40 years, from the brief time we have observed them. 2. This most recent +PDO phase began in 1977 and generally lasted until 2007, assuming that the -PDO period has truly begun. About 30 years. 3. The strongest warming trend was from 1979-1998. Since then, if one looks at ALL of the major global temperature metrics, there has been very little or no upward trend the past ten years. According to models, much of the GW will happen in mid to high latitudes as opposed to the tropics. e.g. http://www.globalwarmingart.com/wiki/Image:Global_Warming_Predictions_Map_jpg I see no reason for serious doubt about that particular model result. Loss of infra-red has a bigger role at high lattitudes. In the extreme case think about the long arctic winter “night”, no sunlight coming in, just infra-red going out. Now check out the “per capita” emissions for those countries, bear in mind that most of the Chinese still aren’t living particuarly emissions intensive lives (not that they’re going to hit the US level). Since then, if one looks at ALL of the major global temperature metrics, there has been very little or no upward trend the past ten years. Sigh … here it is again … the El Niño to La Niña cherry-pick. Jared, given that 1998 featured a big El Nino, and so is anomalous, I do not see how you can draw a negative trend through the data. It is still much warmer than in 1999 or 1997. And of course, I would like to see how you explain stratospheric cooling using PDO, along with a range of other trends. And finally, there’s the question of why CO2’s greenhouse effect should magically stop at 280 ppmv. I’d especially like to see that. But it goes up to eleven! No cherry-picking here. If you take the mean between the strong El Nino of 1998 and the strong La Nina of 1999-2000, and then compare the temps of 2001-2008 to that, you will see that GISS is the only metric that shows real warming. And that is with three El Ninos between 2002-07, and no Ninas in that period. What relationship do you see between stratospheric cooling and C02? And as far as the greenhouse effect stopping at 280 ppmv…that question rests on the assumption that previous warming was mostly (entirely?) due to C02 concentrations. Jared, CO2 accounts for 20-25% of the 33 degrees of greenhouse warming here on Earth. Why should that magically stop at 280 ppmv–the pre-industrial value. And if you don’t understand the issue with stratospheric cooling, …. I ask you a simple question, and that is your response? I know there are different theories on stratospheric cooling, and I wanted to know which you subscribe to. Including 1998 as you do is Cherry Picking. In any of the 3 land/ocean datasets 1998 is a clear outlier. Here are the 3 main surface dataset graphs. See for yourself, you’re looking for a dirty great big spike at 1998, not characteristic of the overall trend since the mid 1970s. It’s part of the fingerprint of the observations predicted for the enhanced greenhouse effect. Your notion also would not explain diurnal range changes. Wow, so using 1998 at all is cherry picking, huh? I guess it should be eliminated from the record altogether then (since it is so anomalous)…which by the way, would negate a signficant amount of the warming in the 1990s attributed to GHG. How much warming is there from 1990-2000 if you take out 1998? It would be cherry picking if I used 1998 as a starting point and said, “Look, 2008 is much cooler than 1998, there has been no warming in the past 10 years.” That is NOT what I’m claiming. What I’m pointing out is that if you look at HadCRUT and the two satellite metrics, global temperatures have shown no appreciable rise the past 10 years. GISS is an outlier in that it has 1998 a little cooler than the others, 2005 a little warmer, and 2007 a LOT warmer. This creates an entirely different trend when looking at the data over the past 10 years. First, there’s not as much difference between GISS and HadCRU as you claim. I seriously doubt that you have much knowledge about the temperature records and a proper analysis of same; you need to study this post. You also fail to understand that global temperature is noisy enough that 10 years is not long enough to get a decent estimate of the rate of change. Limiting to 10 years enables you to focus on the wiggles created by the noise, and convince yourself that there’s no signal there; you need to study this post. 1. You make a lot of assumptions about me, rather unfairly I might add. 2. Name one thing I stated that was false. Does GISS show a much greater warming trend than HadCRUT and the satellite metrics over the past 10 years? Yes. Call it noise or whatever you want, it is a fact. Has HadCRU shown decreasing temps over the past 2.5 years? Yes. 2006 was cooler than 2005, 2007 cooler than 2006, and 2008 is virtually guaranteed to be cooler than 2007. 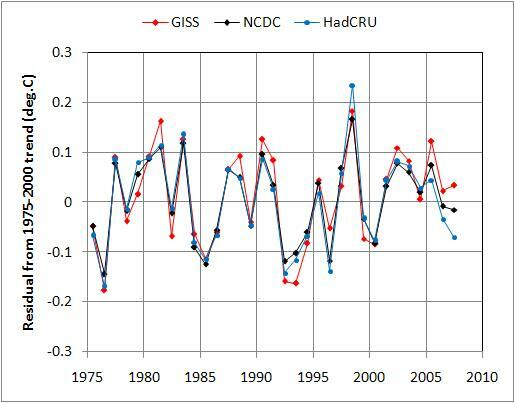 Did GISS show warmer temps for 2005, 2006 and 2007 than HadCRUT and the satellite records? Yes. 3. About the ten year thing…how many times have AGW proponents pointed to ten year periods to show warming? Many. Don’t tell me you can’t discern any trends in a 10 year period, it’s a two-way street. In post 112 your result would be clearly affected by the outlier 1998. Anyone using 1998 as a start/stop date for a claim is wrong (as far as I can see), whether they’re arguing for/against the reality of AGW. However actually Tamino is right, the greater error is probably just fussing over a few years. (I’m no statistician, my electronics has always been practically focussed). I see no qualitative change in that graph that’s atypical for the whole period. In that graph if temperatures are swinging away from the long term trend 1975 to 2007, then there should be a significant change in the graph (as it’s the difference between the trend and each year’s value). That uses 1998’s data, but it goes right through, so it can be seen as noise. Thank you for the references. I’m studying them now. I am grateful to you for accepting, however grudgingly, that I asked honest questions. You advise me to learn statistics, physics and history, and I am doing that. Thanks for your invitation to return with further questions, but you haven’t answered these ones. To apply a small correction, I’m learning about climate science not so as to blow anyone “out of the water”, as you so militarily put it, but in order to find the truth. When you offered the analogy of the seasonal hemispheric temperature changes, I understood and I thought this could be going somewhere. When you reminisced about Electrical Engineers and slow response times I admit I wondered why. You didn’t address my questions. I would like you both to re-read my post, pretend that asking the questions is someone you respect, that a society is hanging on the answers, and try again. What I’m pointing out is that if you look at HadCRUT and the two satellite metrics, global temperatures have shown no appreciable rise the past 10 years. Why 10 years, Jared? That’s what makes it cherry-picking; the decision to start from 1998. Why 1998 and not 1995 or 2001? You have to use all the data, not just a segment of it that seems to support your point of view. Doing the latter is what is defined as “cherry picking,” and the denialist argument of “no global warming since 1998!” besides being wrong is a classic example of cherry picking. You would do well to read over Tamino’s blog. I am not really the best one to address the modeling questions, as climate science is not my day job. However, with respect to the compounding of errors, this presumes systematic bias, not just random error. Since we know that clouds both warm and cool, I rather doubt that the result is a consistent +10%. What is more, when you have uncertainties in a model the thing to do is carry out runs that cover the range of uncertainties. Suffice to say, there have been lots of attempts to show that climate models are bogus. These attempts have always been based on a fundamental misunderstanding of the models–sometimes innocent, sometimes intentional. The thing about the climate models is that they are dynamical physics-based models. You put the physics in, constrained by independent data, and look at what comes out. There isn’t a lot of wiggle room for getting a better fit. The models do a very good job at reproducing the basic trends we see, and this provides strong evidence that the physics is not drastically wrong. I do not know what your background is, but my advice is to come at the problem by understanding the physics. Additional pieces of advice is to ask questions, but be cautious about hijacking discussion threads, and do not discount the expertise of the professional scientists doing this work or the countless others in relevant fields who have looked at the science and found it cogent. Reading through the comments here, it’s clear that there is a real passion for the scientific exploration of AGW. The data are interesting, the climate forecasts are suggestive, and yet there is enough going on within both that everyone, laypeople and scientists alike, can actively debate opposing viewpoints. This forum seems to me rather like an undergraduate college course in which students are told to choose sides on a topic and then defend those sides. The ideas thrown back and forth are fairly well thought out, and often quite good. But, let’s make no mistake, undergraduate-level debating is not the same thing as rigorous scientific analysis. You see, after finishing up that freshman- or sophomore-level general ed course, a climate scientist must then study for seven years to get their doctoral degree. And then, to have reached the point where those maintaining this blog are at, another decade–at least–of full-time work is required. Those years of dedicated work and study do not make the scientist correct, but they should engender a certain amount of respect in their arguments. Also, because a very large number of scientists agree on AGW, and far fewer dissent, this does not mean that the majority is necessarily correct. But that lopsided consensus ought to at least receive careful consideration. If upon visiting your physician, you receive an undesirable diagnosis, it’s recommendable to get a second opinion, or perhaps even a third. However, if you consistently get that undesirable diagnosis, doctor after doctor, this should tell you something. You can always eventually find an opinion that is more to your liking, but I don’t think that any of us would think this is sound medical judgment. Why then, when the vast majority of climate scientists look at what is happening to our climate and diagnose it as AGW, do so many insist upon getting another opinion? Why is an article in Skeptic magazine, hardly a technical journal, being trotted out to attack a technical and very straightforward blog entry? The fact that those denying AGW need to cite vast global conspiracies of grant-hungry scientists, or universal academic ignorance of the urban heat island effect, to argue their point should make their point more than suspect. But then, the great thing about science is that it doesn’t care what peoples’ opinions are. Here, the facts are in, AGW is real, all that’s left to debate are the effects of our species’ actions. But then, I guess that’s just my opinion. As far as answering your questions. My respectful advice is (I have stated this in another recent post) that you should have confidence with Climate scientists as represented by the contributors to this site and the IPCC. This is a very good web site and you will find all or references to all of your answers here. Another bit of advice, be ruthless with your ideas and prejudices. Objective reality, unfiltered from your own prejudices and preconceptions must always be the benchmark for your ideas when seeking the truth. If someone tells you that your house is on fire you do not go around asking other people: “Is my house on fire?” in the hope that you will get an answer that you like! I am a layman but usually quite good at assessing the weight of scientific evidence and evaluating competing hypotheses. These two articles left me bewildered to say the least. What is wrong with the arguments presented here? I could not figure it out even with the help of Gavin’s comments above. On the face of it they look like devastating critiques of the reliability of climate modelling. Can someone PLEASE refer me to a comprehensive and accessible critique? I must say that these arguments would have swayed me if I were to be a policy-maker. I just finished Frank’s article, and I have to say that it makes really two assumptions that aren’t valid (and have been pointed out by Gavin). 1) The cloudiness error here reports, of ~10%, is the standard error, i.e. it’s the root-mean-square error. That is, you take the GCM ensemble cloudiness forecasts across all latitudes, subtract the observed cloudiness, square the result, and take the square root. This is perfectly acceptable to characterize many types of errors. However, in this case he uses this number 10%, to then say that there is a 2.7 W/m^2 uncertainty in the radiative forcing in GCMs. This is not true. Globally-averaged, the radiative forcing uncertainty is much smaller, because here the appropriate error metric is not to say, as Frank does: “what is the error in cloudiness at a given latitude” but rather “what is the globally-averaged cloudiness error”. This error is much smaller, (I don’t have the numbers handy, but look at his supporting materials and integrate the area under Figure S9), indeed it seems that global average cloud cover is fairly well simulated. So, this point becomes mostly moot. 2) He then takes this 10% number, and applies it to a linear system to show that the “true” physical uncertainty in model estimates grows by compounding 10% errors each year. There are two problems here: a) as Gavin mentioned, the climate system is not an “initial value problem” but rather more a “boundary value problem”–more on that in a second, and b) the climate system is highly non-linear. Okay, to explain. A linear system is one in which a 10%–say–change in the inputs will yield a predictably scaled percent change in the outputs. And, at any level (for instance of CO2 concentration), this would be true. The oft-quoted temperature sensitivity to a CO2 doubling assumes to a certain degree that the climate would respond linearly to greenhouse gas forcing. In fact, the climate system is highly non-linear, with a whole variety of positive and negative feedbacks that assure that the behavior of the system at a certain state of temperature, CO2, humidity, etc. will be different than at some other state. The significance of the non-linearity of the system, along with feedbacks, is that uncertainties in input estimates do not propagate as Frank claims. Indeed, the cloud error is a random error, which further limits the propagation of that error in the actual predictions. Bias, or systematic, errors would lead to an increasing magnitude of uncertainty. But the errors in the GCMs are much more random than bias. Even more significantly, the climate system is a boundary-value problem more than an initial-value problem. An initial-value problem is one where you specify completely the initial state of a system and then let it go. If you’ve correctly described the initial condition, and the physics of the system, it should behave appropriately moving forward. However, initial-value problems are really only appropriate for closed systems. These are ones where there is no exchange of mass or energy outside of the system. Or, that exchange is small compared to the mass and energy fluxes within the system. On the contrary, the climate system is an open system in both ways, but particularly energetically. The energy incident upon the system from the sun drives the system in its entirety, and greatly dwarfs the energy fluxes within the system. Therefore, what’s happening at the boundary of your system will drive what happens inside. Said another way, accurately characterizing the boundary conditions is much more important than describing the dynamics of energy exchange within the system–unless those effect the boundaries. So, getting things like global average albedo, global average cloudiness, and so forth will dictate the radiative exchange to a far greater degree than the regional behaviors of the models. Another way to look at this is that climate modelers must first “spin-up” their models for as much as 100 years to mitigate the effects of inappropriate initial starting values. After that time, the simulated system approaches an equilibrium and is ready for the actual simulation period. This is exactly how boundary-value problems behave, and this is one method to reduce the uncertainty in representing things like ocean temperature profiles in the models. 1) Frank asserts that there is a 10% error in the radiative forcing of the models, which is simply not true. At any given latitude there is a 10% uncertainty in the amount of energy incident, but the global average error is much smaller. 2) Frank mis-characterizes the system as a linear initial value problem, instead of a non-linear boundary value problem. This crucial difference means that his argument about propagation and amplification of uncertainties does not apply here. The real system is rife with positive and negative feedbacks that will respond very differently depending on the state of the system. There are certain instances where uncertainties would indeed propagate, including rapid ice sheet melting, and that is why the IPCC includes the caveat that their results do not include such effects (Which could actually lead to much more rapid warming). Let me also state here, Frank is a PhD chemist, not a climate scientist–though there are certainly areas of real overlap there. This is why he’s liable to make such elementary mistakes when describing how the system works. It’s akin to asking a radiologist to perform a biopsy. Yeah, they both work with cancer, but in very different ways. There’s also a reason why this article is in Skeptic instead of Nature or Science. It would not pass muster in a thorough peer-review because of these glaring shortcomings. I hope this (somewhat long) post helps. Sorry I didn’t get a chance to read your second link. how many times have AGW proponents pointed to ten year periods to show warming? Many. Do tell. Show us where “AGW proponents” use trends determined from a 10-year time span of data to show warming. Re Lindzen’s “Powerpoint” presentation, the problems seem to arise from some essentially incorrect assertions. [“2. Although we are far from the benchmark of doubled CO2, climate forcing is already about 3/4 of what we expect from such a doubling. Each of these is wildly incorrect. Focussing on point #3, we can determine that the 20th century warming (’til now) has been around 0.8 oC (either NASA GISS or Hadley data). We know that the atmospheric CO2 concentration has risen from around 300 ppm at the start of the 20th century to 385 ppm now. Its straightforward to calculate that with a climate sensitivity of 3oC of warming per doubling of atmospheric CO2 (the “best estimate” of the climate sensitivity which is consistent with the model data), that an increase in atmospheric CO2 from 300 to 385 ppm should yield an equilibrium temperature increase of around 1.1 oC. Thus rather than having “only about 1/3-1/6 of what models project”, we’ve already had 0.8/1.1 or 3/4 “of what models project”. However note that the climate sensitivity relates to the Earth’s temperature rise at equilibrium. It takes a significant amount of time for the Earth’s temperature to re-equilibrate to a higher greenhouse forcing due to the large inertia resulting from a massive ocean heat sink. If one assesses the models one can estimate that we still have something like 0.5 -0.6 oC of warming still to come from the levels of greenhouse gases already in the atmosphere. So we might expect that the 385 ppm of atmospheric CO2 (should we stop all emissions dead right now) would give us an equilibrium temperature rise at some time in the future of 1.3-1.4 oC above early 20th century levels. That’s a bit higher than models would predict within a set of parameters equivalent to a climate sensitivity of 3 oC. Probably some of the “excess warmth” is due to the solar contribution of the early 20th century (e.g. the period 1900ish-1940ish. My own feeling is that Lindzen would like to promote the notion of his “Iris” effect that he describes in his Powerpoint presentation. This seems to be a notion in which the atmosphere responds to warming by increasing cloudiness that counteracts the warming (a sort of homeostatic effect that regulates the Earth’s temperature with a cloud feedback). Clearly if one wishes to promote this notion, one needs to assert that there hasn’t been as much warming as expected. Interestingly, another contrarian notion doing the rounds right now is that much of the 20th century warming can be explained by some unspecified cloud feedback to ocean circulation (“Internal radiative forcing”!). I’m suspect that were you to read an account of that it might seem wonderfully plausible too! However, unless I’m misinterpreting everyone’s clever notions, it (a positive/warming cloud feedback) is in direct contradiction to Lindzen’s notion (a negative/cooling cloud feedback). Actually Lindzen’s iris works the other way — tall skinny clouds in warmer conditions; broad flat clouds in cooler — if this is correct. Someone else has suggested it works the opposite way but has the same result, adjusting to cool the planet automagically as needed. Was that Christie, maybe? O.K. fair enough, but my point is that Lindzen’s “Iris” model is a homeostatic notion that supposedly acts to counter global warming via a cloud response, whereas Roy Spencer’s “internal radiative forcing” notion is a “feedback” (‘though I don’t think he considers the term appropriate) that amplifies, or responds to ocean circulation oscillations, and has been (supposedly) the major source of 20th century warming. In other words each uses clouds as all-encompassing explanations in opposite directions (for lack of warming according to Lindzen whose “Iris” hypothesis requires that we’ve had less warming than expected – even ‘though we haven’t; and for most of the 20th century warming according to Spencer). Those bearing flowers (irises) need too fully explain the much warmer previous interglacials, at least terminations 2, 3 & 4. For the iris effect is presumed to prevent this, yes? [2. Although we are far from the benchmark of doubled CO2, climate forcing is already about 3/4 of what we expect from such a doubling. Well we can take a look at what he says and where we could look for such data. If by the late 19th century we could infer 1880 and if by already we could infer 2003 then we could use the GISS Radiative forcings data for Well mixed GHGs. In that period the GISS forcing for W-M GHGs has increased by 2.7487 (W/m^2). Which is about 3/4 of 3.7 (W/m^2). This does not quite match your “wildly incorrect”. Personally I would favour the 52% figure but even that would imply and equillibrium temperature rise of over 2C if the atmospheric composition was frozen at the 2000 figure. (I have assumed the same 4C/doubling that he is criticising). You arrive at your 1.1C increase as if CO2 was the only show in town. from the GISS total forcing you would get a ~1.55C increase at equillibrium using your prefered 3C/doubling. As only about a 0.8C increase occured about 0.7C would need to be “in the pipeline”. That is quite a high ratio of pipeline to occurrence. It may be the case but it may not. Now I do not like people picking just which bits suit them but I think you may both be guilty of that. Also either of you may have been using forcing figures that differ markedly from the GISS ones. Finally he could have gone one step further and just set the effect of the cooling aerosols to zero and then had a 1900-2000 forcing of 3.5168 W/m^2 a whopping 95% of the effect of doubling CO2. I was under the impression that the “iris effect” was discounted because if it worked as advertised then the atmosphere would never have warmed (or cooled) with forcings the strength of the Milankovich Cycles. The iris wouldn’t open or close solely due to changes in co2. Let us take your statements one at a time so that there can be no obfuscation. to predict future climate statistically a better fit than the ensemble of climate models? Yes or no. arguments from highly reputable authors in peer reviewed journals? Is Pat Frank’s fit better because it contains the essence of what is driving the climate models? Yes or no. Are the models a true representation of the real climate given their unphysically large dissipation and subsequent necessarily inaccurate parameterizations? Yes or no. Does boundedness of a numerical model imply accuracy relative to the dynamical system with the true physical Reynold’s number? Given that the climate models do not accurately approximate the correct dynamics or physics, are they more accurate than Pat Frank’s linear equation? Yes or no? What is the error equation for the propagation of errors for the climate or a climate model? Have you seen Roger Pielke Jr’s Prometheus blog posting on this subject? I have to say it had a number of mistakes which seemed uncharacteristic of RPJr. It looks at “observed trends in global surface temperature 2001-present (which slightly longer than 8 years)”, which of course is only slightly longer than 7 years. That the observed trends were up to “-1.5 +/- 2.2 C/decade” when it should be per century. If you actually look at the last 8 years of data the trends are quite different, i.e. more positive. But his claim that a short observed cooling trend can “falsify” the models is most disappointing. Surely in the same way one hot summer does not prove Global warming is happening, one cold trend (even if real) could still be consistent with the models, it is just not going to happen that often. Sadly I am not sure statistics is RPJr’s strong suit. I seem to remember the expression “God of the Gaps”. #108 CobblyWorlds: The discussion is not where the Global Warming will change surface temperatures the most. What my question discusses is HOW. In the GH theory, the surface warms because it gets extra energy by emissions from the troposphere, and the troposphere emits more because it has previously got much warmer, because of the GH gasses absorbing energy. However, provided that the troposphere is not as warm as predicted, for whatever the reasons, how is the surface going to warm as much as the models predict, if it cannot receive as much energy from the troposphere as the models predicted because the troposphere is not as warm as the models predicted, for whatever the reasons. 2.- The atmosphere has much less water vapour there (can reach almost 0, depending on how extreme the cold is), so also its capability to absorb the infrared radiation is very limited (let’s remember that water vapour causes an 85% of the GH effect). 3.- The surface temperatures are much colder in the poles, so the earth emits less infrared radiation there, and the ammount of radiation that each molecule of any GH gas can absorb is also less. To sumarize, less radiation available to be absorbed by also less molecules leads to much lesser increase of temperature by absorption of energy, and also, less polar tropospheric temperature means even less emission back to the surface. So to repeat myself, yes, the poles can increase their temperatures more than the rest, but it won’t be because of the GH effect taking place in the poles but elsewhere, and then some redistribution of the heat. Anthony Kendall Re critique of Frank. Sir you have just made my day. Hallelujah. I could follow your argument 100%. I think it is this point about peer review where I slipped up. Should have known better. But tough for laymen to follow peer reviewed articles so we end up reading a lot of trash. Ummm extremely cautious about posting here because of huge risk of getting head blown off (as in western front 1914-18) but here goes: are there any lessons in prediction markets, that have been shown to have some success in predicting various outcomes such as software project targets? Actually, and more frustrating, tough for laymen to even access many peer reviewed articles without shelling out $15-$30 per article. And that’s before one knows what’s really in the article. The other way to reduce download times is to make sure that you only download what is wanted. If you only want a time series of global mean temperatures, you shouldn’t need to download the two-dimensional field and create your own averages. Thus for many purposes, automatic global, zonal-mean or vertical averaging would have saved an enormous amount of time. Do you know whether anyone has done this (archived a globally averaged time series version, with annual or monthly steps, somewhere where it would be publicly available)? Alex, I did analyze. I did a back of the envelope calculation to show that the warming over the last century is consistent with the models. However one tries to rescue the situation, it’s not possible to support the assertion that “the observed warming is only about 1/3-1/6 of what models project”. There are at least three fundamental problems. You highlight the first and the second one. Taking your total forcing (including, as you quite rightly point out, all greenhouse gases and not just CO2), and an expected equilibrium warming of around 1.5 oC, we’ve already had around 0.8 oC of this. However we know full well (and this is represented in models as the temporal evolution of temperature under forcings) that total greenhouse-induced warming relates to the warming at equilibrium. Let’s take the value of the “in the pipeline” warming from Hansen’s model (around 0.6 oC [*****]), and we arrive at an equilibrium warming of around 1.4 oC. You indicate that the total forcing (so far) should give us an equilibrium warming of around 1.5 oC. So the warming so far is consistent with the models/best estimate climate sensitivity (you could say we’ve had 90-95% of the warming expected). Now either the models are laughably incorrect as Lindzen says (he asserts we’ve only had 16-33% of the expected warming) or they’re not. Your analysis is consistent with the latter, since, although we don’t know exactly how much warming we have still to come, the models are consistent with an expectation that we’re on track to have 90-95% of the expected warming [note that I’m using Lindzen’s assumption that all the warming if the last century is from greenhouse gases “Even if we attribute all warming over the past century to man made greenhouse gases…”] . Lindzen considers that rather than 0.8 oC of warming in the last century we should have had something between 2.4 and 5.4 oC (according to his assertion of what is expected if the Earth’s temperature evolves according to the models). This would indicate a climate sensitivity somewhere around the range of 5 – 11 oC per doubling of atmospheric CO2 (or higher if the “composite” “time constant(s)” for attaining equilibrium were greater than expected). The third problem is that the models themselves don’t over-predict warming by a factor of three to six-fold. Hansen’s early GCM model for example [***], that allows a 20-year forecast to be compared with reality, comes reasonably close to the measured temperature evolution. The model does slightly overestimate the predicted temperature but, as the authors state “Indeed, moderate overestimate of global warming is likely because the sensitivity of the model used (12), 4.2 oC per doubled CO2, is larger than our current estimate for actual climate sensitivity, which is 3 +/- 1 oC, based mainly on paleoclimate data (17).” . Alternatively if the 20th century temperature evolution is modeled under known forcing estimates and using a climate sensitivity of 2.7 oC, then the modeled surface temperatures match the measured surface temperatures pretty well [*****]. So how can anyone assert that the models are overestimating global warming by a factor somewhere between three-fold and six-fold? So Lindzen’s assertions about the expected warming and massive overprediction of warming by models are demonstrably wildly incorrect. No “cherrypicking” is required to establish that fact. THAT depends on the characteristics of the uncertainty and on the characteristics of the effect and on the time over which they persist. Yes, there are significant uncertainties in climate models. No, the effect of adding CO2 is not among them. I’ve heard only a few skeptics out there who actually understand the physics of climate, and their reasons for dissent have lacked a sound physical basis. This is reflected in the publication record–almost nobody is publishing papers that dissent from the consensus position. Those few papers that do dissent, either misunderstand the physics or are greeted with collective sigh because they simply don’t show a way forward. Scientific consensus is achieved when the opposition stops having anything to say in refereed science journals. By any reasonable measure–publication, citations…–we’re there. Remove 1998 from the records. Then tell me how much warming occurred in the 1990s. What has to be realized is that extreme anomalies work both ways. They may help a trend go upwards one way, but then help create a downward trend the other. Also, ten years is supposedly such a short time to measure climate, but what about 20 years? Are those periods so much longer and more telling? 1978-1998, a 20 year period of definite warming…1998-2008, a ten year period of equlibrium. Do the frigging math. If you fit a linear trend to the data, the trend is still upward. By citing each others nonsense. numerically, what does that say about all of the manuscripts that have been published using climate models? Gavin – I keep trying to post and my posts are not showing up. Could you tell me why? Ok, I have been informed that using 1998 is cherry picking, and therefore I apparently cannot post anything about that year. Very well. HAD, RSS, and UAH show no real upward trend. Now the question is, how significant is this? Is it a blip or the start of a longer trend? Time will tell…the next 10-20 years will be very telling, with the -PDO phase and projected low solar activity. All I am asking is that we have an open mind and consider multiple scenarios. Also, ten years is supposedly such a short time to measure climate, but what about 20 years? Are those periods so much longer and more telling? Yes, longer periods are more telling. Not only do they provide more data points, as the time span grows, the signal grows but the noise level remains the same, so there’s a larger signal-to-noise ratio. You seem unwilling to admit to yourself that you don’t understand the impact of noise in temperature time series on estimates of trend rates. If you’re really interested in learning, you should heed the advice I gave earlier and study this post. You should also answer my question. Can you show us where AGW proponents use trends determined from a 10-year time span of data to show warming? Or did you just make that up?